Following her graduation in 2013 with a cuisine diploma, Gabriela Kook has showcased her culinary talents on a variety of media platforms, most notably on MasterChef Korea in 2014. Gabriela became passionate about French cuisine when she first set foot in Paris. She then decided to sign up for Le Cordon Bleu Paris Cuisine Diploma. After successfully completing her diploma in 2013, she carried out an internship at the renowned two Michelin-starred Parisian restaurant: Apicius. During her internship, she also applied to take part in MasterChef Korea and in 2014 was selected to be one of the candidates for the third series. Following three months of intense competition, Gabriela finished in second place opening up numerous career opportunities, especially in Korea. Also an expert in the arts, she went on to create her own channel on YouTube in order to combine her passion for cuisine with the making of videos. 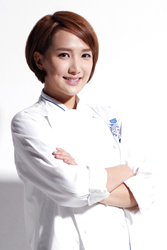 In addition, she takes part in culinary demonstrations at events throughout Korea and appears on television cookery programs. Gabriela will also be the star of a documentary on cuisine and travel, which was filmed in South America from EBS Korea.